Just as freshly ground coﬀee beans can add more depth and ﬂavor to your morning brew, while protecting against unpleasant bitterness, freshly milled grains can add a similar beneﬁts package to your whole grain baked goods. Grinding grains into ﬂour, or coﬀee beans into grounds, kick starts the oxidation process, which can eventually allow the ingredients to get rancid over time. For this reason, freshly milled whole grains are gaining popularity among chefs, bakers, and home bakers alike. 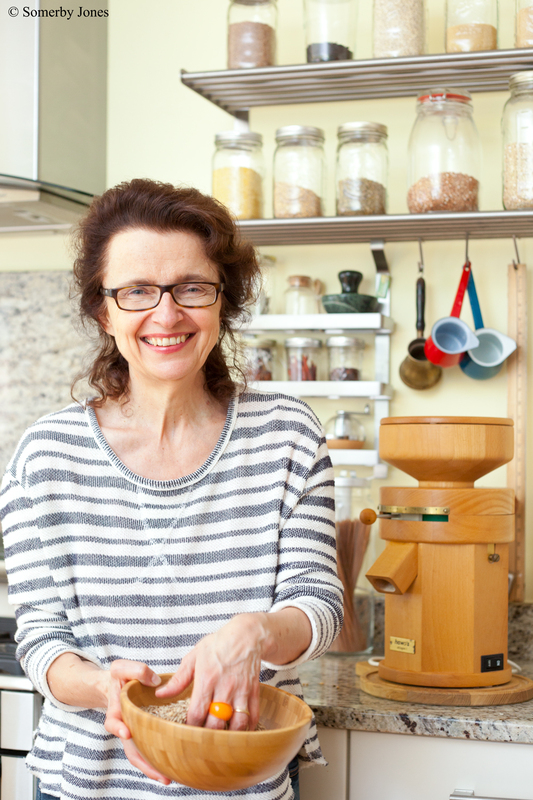 To learn more about the grain-milling trend, we turned to WGC Culinary Advisor Maria Speck. Speck is the award-winning author of Simply Ancient Grains and Ancient Grains for Modern Meals (both by Ten Speed Press). She has won a Julia Child and an M.F.K. Fisher cookbook award, and is the proud owner of multiple grain mills. Oldways Whole Grains Council: You’ve written in your cookbooks about your love of freshly milled ﬂour. How and when did your journey to home milling begin? Maria Speck: My passion for home milling began in Germany, where I spent my formative years. In Germany, we have a long tradition of freshly milling grains for baked goods, not only for our legendary whole-grain breads but also for delicate cookies and cakes. A tabletop mill was the ﬁrst major kitchen appliance I ever bought, the moment I realized how out-of-this-world baked goods with fresh ﬂour taste. It is a revelation—similar to comparing an aromatic farmers market tomato to a ﬂavorless specimen from the supermarket. I always say once you try it, there is no way back. WGC: What are some of your favorite grains to mill, and what are some of your favorite uses for them? 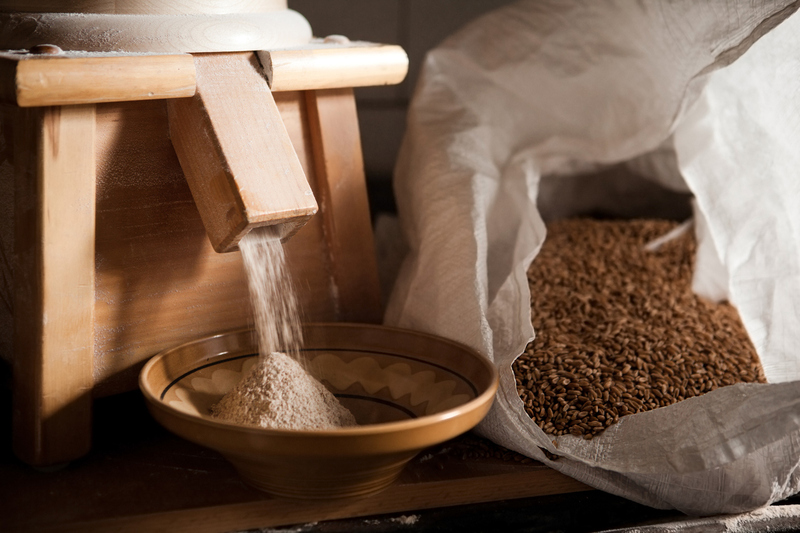 MS: I mill all grains that I have in my pantry—from corn to spelt, to barley, farro, and rye. Fresh milled corn makes the most heavenly cornmeal or polenta. I mill grains for bread and simple homemade pasta, but also for muﬃns, pancakes, cookies, and cakes. And one of my favorite weeknight side dishes is cracking grains such as rye or spelt in my mill for a quick-cooking savory porridge. WGC: Foods retain more of their nutrients when they are used at the peak of freshness. But there are also culinary beneﬁts to baking with fresh ﬂours too. Can you describe some of the ﬂavor beneﬁts and diﬀerences? MS: To this day, I continue to be surprised at the ﬂavors that emanate from a bowl of fresh ﬂour on my kitchen counter. In my fresh baked breads, I have smelled the sweet scent of molasses, cocoa, or honey — yet none of these ingredients were added to the dough. Fresh ﬂour adds aromas to your baked goods that are unsurpassed. Furthermore, it has a natural sweetness which makes it possible to use less sugar in baked goods. Most important, even if you don’t own a mill, more and more farmers and small local mills are oﬀering to ship freshly ground ﬂour to your door. I have many sources for local grains and good ﬂours on my website: www.mariaspeck.com. WGC: You have been a passionate advocate for spreading the joys of home milling whole grains. What other chefs and bakers around the country are also leaders in this movement, serving baked goods made of freshly milled ﬂour? MS: Countless bakers and chefs across the country are increasingly exploring fresh ﬂour. They either order fresh milled grains from local millers or mill their own in their kitchens. From San Francisco to Philadelphia, from DC to New York, there are now so many now that I have stopped counting. In my hometown of Cambridge for example Jason Bond of Bondir has pioneered the use of fresh local ﬂour for years. And Pammy’s, which opened last year, mills the ﬂour for their pasta and bread in-house, so does the Venetian-inspired SRV in Boston’s South End. The more people taste bread, pasta, pizza, cakes, and cookies with freshly milled ﬂour, the more they will ask for it. I believe this is just the beginning of the next revolution in food.